Compare Necklace Lengths by Kim Lee Ozawa for Diamond Necklaces, Gemstone Necklaces, Pearl and Crystal Necklaces, Sterling Silver Necklaces, Sterling Silver Lockets. Collars are usually made up of three or more strands and lie snugly on the middle of the neck. Collar lengths go best with V-neck, boat neck, or off the shoulder necklines. A choker is the most versatile of all the single strand lengths. A simple choker can go with just about any neckline and can be worn for any occasion. See diamond necklaces, gemstone necklaces, pearl and crystal necklaces, sterling silver necklaces, and pendants. If you have a slightly wider neck, a princess length may fit more comfortably than a choker. The princess length is best suited for crew and high necklines. It also complements low plunging necklines. Princess lengths look great with pendants. Also, see diamond necklaces, gemstone necklaces, pearl and crystal necklaces, zodiac necklaces, sterling silver necklaces, and awareness necklaces. Keep in mind that necklaces with a heavy pendant will hang slightly longer and an 18 inch necklace will hang farther down on a petite woman. The matinee necklace is very sophisticated and is commonly used for casual or business dressing. See diamond necklaces, gemstone necklaces, pearl and crystal necklaces, sterling silver necklaces, and sterling silver lockets. When the opera length is worn as a single strand, it is refined and perfect for high or crew necklines. This length can also be doubled and serve as a two strand choker. An opera length pendant is unique and will compliment any outfit. See gemstone necklaces. This elegant length can be broken down into a multi-strand necklace or a multi-strand bracelet. Both Rope and Lariat can be over 45 inches long, but the ends of a Lariat are left unattached for knotting or wrapping around the neck. (similar to a scarf) Lariats can also be worn around your waist. See gemstone necklaces and sterling silver necklaces. 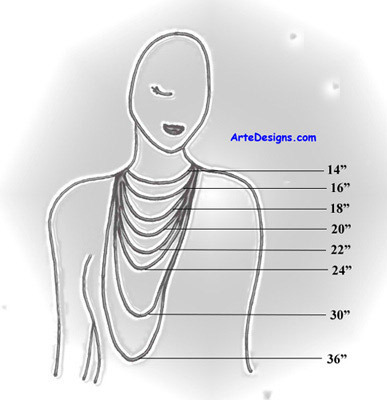 Necklace lengths by Arte Designs for diamond necklaces, gemstone necklaces, pearl and crystal necklaces, sterling silver lockets. Necklace lengths should compliment your outfit and compliment your size. See the difference between a collar, choker, princess, matinee, opera, and rope or lariat length.